It's hard to believe Easter is just around the corner. This year is going too fast for me to keep up! I swear it felt like yesterday that I was laughing at how quickly the Easter displays went up to replace the Christmas stuff at the beginning of the year, it has managed to creep up on me. My days are getting busier and busier, so I am easily drawn to the simpler, quicker desserts that I can pull together at the last minute. 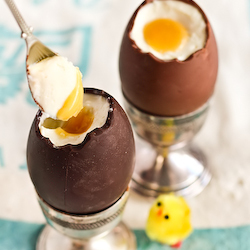 This recipe could not be any easier; there's no baking involved and it takes hardly any time to create these cute Cheesecake-Filled Chocolate Easter Eggs with a 'yolk' made of passionfruit sauce. I took it as a compliment when Lisa (who hates eating eggs) said that these looked so much like real eggs that she was a little creeped out by them. The texture of the chilled cheesecake and the passionfruit sauce looks just right, making it a great filling for some regular hollow chocolate easter egg shells that I cut the tops off. I was inspired by the chocolate-mousse filled Easter egg cups that I've seen on sale and decided to do my own spin on that idea but with a cheesecake filling and a deliciously fruity filling in the centre that would look like an egg yolk. So it looks a little like a creme egg. It's not the same but it's just as tasty. I used my regular chilled cheesecake filling recipe for this, and made up a sauce using passionfruit pulp, apricot jam and a little bit of butter. There's enough sourness from the passionfruit (and the lemon in the cheesecake) to make this a light, creamy and not overly sweet dessert. And it does not get easier than this. It's quite interesting to see how simple this recipe is compared to the Easter Bunny Macarons (including all the hilarious scenarios that I got carried away with while photographing them) and Hot Cross Bun Ice Cream Sandwiches that I came up with last year. This recipe is much quicker and less complicated, but hopefully just as enjoyable to eat! Alright, I admit I may have taken a few too many photos of these little treats. Probably more than was necessary. But I am still a little scarred from all the trouble I had with the ugliness that way my Twix Cake so I was just happy to have something cute and not falling apart to photograph. Surprisingly A was all excited when he saw these in the fridge and quickly ate two of them, I can never guess which of my recipes he'll end up liking but he was a big fan of the fluffy cheesecake filling and the small hit of passionfruit in the centre. Technically it's more of a cheesecake mousse since there's no crust (though you could put some crust at the bottom of each egg if you wanted) and it's not baked, or a cake. So if you're looking for a really, really, REALLY easy and light dessert to serve up after a big meal during the Easter break then these are for you. They can be eaten with a small spoon or devoured like a creme egg, whatever floats your boat. I bought the chocolate eggs from the supermarket, but if you're feeling really adventurous you could try making your own. Any plain, regular-sized hollow chocolate eggs will do. I got some very pretty ones that had all different flavours, I especially liked the look of the white chocolate and strawberry shell below. I hope everyone has a wonderful Easter holidays, I am looking forward to some time off! For the 'yolk': 1 passionfruit, 1 tbsp apricot jam, 1 tbsp (about 15g) unsalted butter (passionfruit juice can be replaced with about 2 tsp of freshly squeezed orange, mandarin juice or mango, peach nectar, you can adjust the amount of juice to taste), alternatively you can substitute with any fruit curd you prefer. Optional: you can include some cheesecake crust crumbs at the base of each egg if you really want to include some sort of crust into the dessert. Using a small serrated knife, carefully remove the tops of the chocolate eggs. (A couple of people have mentioned that heating the knife under warm water will make this easier and neater, thanks for the tip! But personally I like having the jagged edges.) Place the eggs in the fridge to keep them chilled while you prepare the cheesecake filling, you can use egg cups or your fridge egg holder (Don't use an egg carton like me. I shouldn't have used it but I was desperate at the time, I bought the egg cups the day after!). Place the cream cheese, icing sugar, lemon juice and vanilla in a large mixing bowl and beat on high until the mixture is smooth and fluffy, about 3-4 minutes. Set aside and carefully whip the thickened cream in a separate mixing bowl to stiff peaks (watch it closely as thickened cream is very easy to overwhip and split). Using a whisk, gently combine the whipped cream into the cream cheese mixture until it is smooth. Carefully spoon or pipe the mixture into the prepared chocolate shells. Chill eggs for at least 30 minutes to allow it to set. Prepare the passionfruit sauce; strain passionfruit pulp to remove the seeds and place in a small saucepan with the apricot jam and butter. Gently heat on low, whisking until the butter melts and the mixture is smooth. Remove from the heat and allow to cool. (If your apricot jam is chunky you should strain the sauce at this point) Place in the fridge and chill until it thickens slightly. Using a small spoon, carefully scoop out a hole in the centre of each cheesecake, about 1 cm deep and wide. Fill hole with some of the chilled passionfruit sauce and return the eggs to the fridge to chill again for at least 30 mins. Remove eggs from the fridge about 10 minutes before serving. Can be made 2-3 days in advance, keep eggs in the fridge in a holder inside an airtight container or covered tightly with clingfilm to stop them drying out. 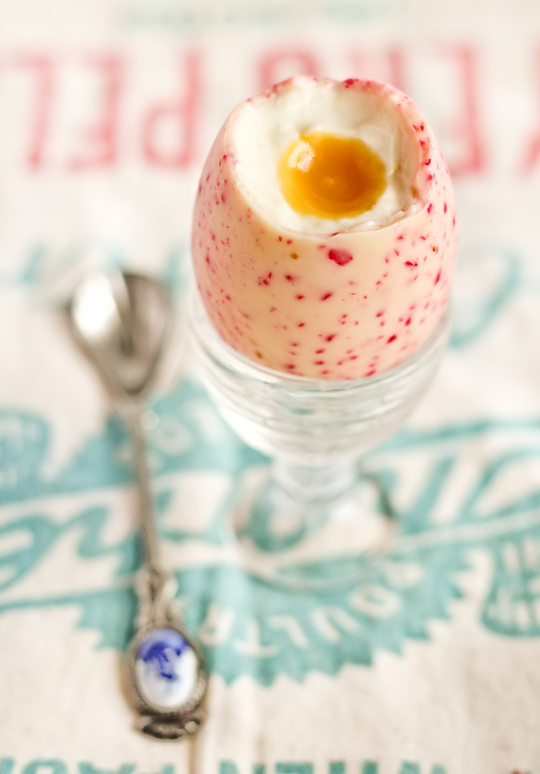 the white choc raspberry egg is so purdy!!! What a great idea! These are adorable! I bet they are delicious, too. Oh wow, definitely giving these a go this weekend! Thank's for the great idea! OMG - amazing! Where are your choc eggs from? Ummm craps I forgot what the brand was, but I got them from Coles! We're they Chocolatier egg selection? They come in 6 different varieties. You can get from woollies too and other local supermarkets. Yes that's the one! They are a little pricey - 10 bucks, but worth it I think! Did you have trouble taking the top off the white cookies and cream? Ahhh! It wasn't too bad, I just cracked a small hole and then broke off bits until I was happy with the size. A little fiddly but I like the jagged edges! you can buy a chocolate egg mold on amazon for $1.75 and then make as many eggs as you like! 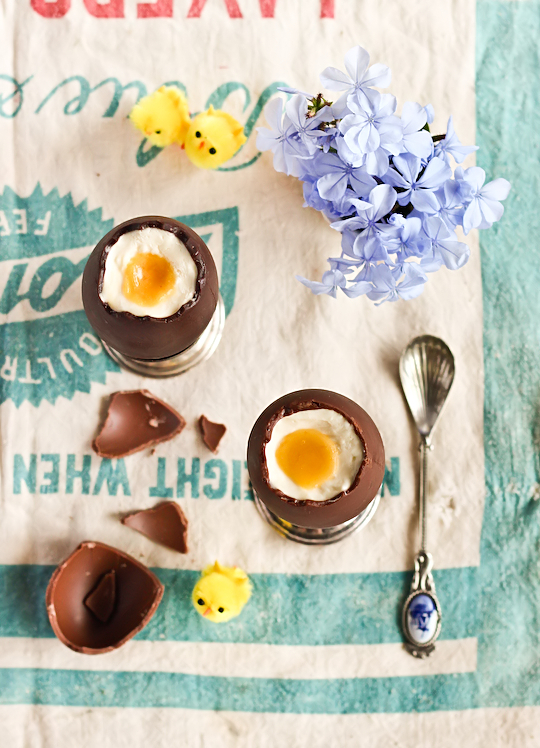 What a perfect combination: whimsical little desserts in vintage antique egg cups. Lovely ! Sooooo cute and what a genius idea! These look so real (well, as real as chocolate eggs can look!). Cute chickies, too! Any suggestions if passion fruit is not easy to come by? Would mango work? Mango would definitely work! So would orange, mandarin or peach! Just use about 2 tsp of juice. 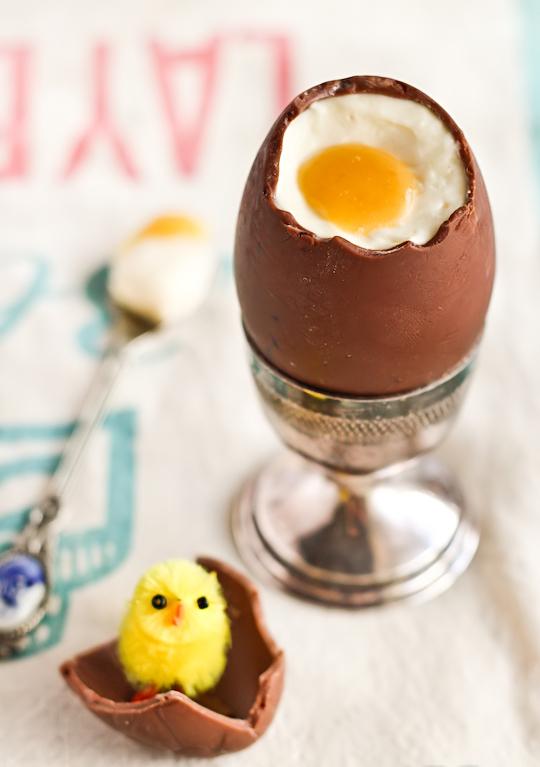 This is such a great idea and the egg innards look so real! Would it be wrong to have these around Christmas time lol? My husbands family has a "high tea" every year just before Christmas and we all bring a sweet and/or savory dish. Haha maybe you can fill some Christmas-themed chocolates instead! You could do what I'm doing and instead of having them stand upright cut them in half length wise so they look like deviled eggs. Not as Eastery themed and bound to tilt a few heads, haha. Suggestion: Use a white chocolate and paint decoration on the outside shell too. They look so realistic... but with chocolate *drool*! have pinned them! Once again amazing . I think I might attempt these little beauties. You're work is beautiful. I'll have to try making some of these cute eggs. Thank you. Chocolate eggs are the perfect Easter treat! Oh wow, that is so unbelievably cute! I wish I had easter plans to try it! You have me swooning! I had seen something like this years ago but they made their own chocolate shells. This is marvelous to buy the shells - duh! I will have to give these a try. I adore the idea of passion fruit for the yolk too. I didn't think there were too many pictures (of course I put way too many in too) but I loved all of your pics! These are adorable and I would love to Pin them. I see there are already LOTS of pins and repins.... but I read that you require permission before using any of your images. I am curious... did the the first person to Pin this get your consent, and if so, then can we repin them? I ask this because I have been very concerned about the possible infringement of copyrighted material, not so much my own property but when using other's. I have the CC notification/requirement link and a Pinterest link at the top of my sidebar. I also have a PIN button at the bottom of most posts. I love your blog and will be following! Bunny Jean - My work is covered by a Creative Commons Attribution-NonCommercial 2.5 Australia, which means anyone is free to use my images so long as they properly credit me with a link back to the original content. So there's no need for someone to get consent to pin something to pinterest, so long as they provide the proper link back to the post on my blog. It is more of a courtesy than a requirement that I ask people to ask for permission first, especially people who are reusing a lot of my images or are copying a recipe. My main issue is with people who copy my content on to their own sites and either don't link back to me at all, or only link back to the front page of my blog, especially those who are getting an income from their web traffic via advertising. Hope that helps clear things up! Oh thank goodness. I hadn't thought to ask for permission since the pin has your blod address underneath it and clicking on it takes you straight to this post. Then I read Bunny Jean's comment and started to panic until I read your reply. Phew! I must admit - the pin went crazy -within a day almost 70 people repinned. No wonder though, these are C-U-T-E!! Just FYI, but pinning something on Pinterest shouldn't violate any copyright laws, since you aren't copying them. You are creating a link. It's the digital equivalent of a reference or a bibliography. "Go over here and look at this great thing." TychaBrahe - That's pretty much what I was saying. But there are still plenty of images floating around on Pinterest without a link to the original source, which defeats the entire purpose of Pinterest in my opinion! I'm pretty sure I could cope with eating these on Easter morning! They look great! So cute!!!! I especially love the second pic, the chick coming out of the egg, so pretty!!! Love it! This is genius! And looks yummy! This is genius and with a few alterations could be even quicker to make using the new Philadelphia cream cheese filling already made up and using caramel sauce for the egg yolk. These are fabulous!! I can't wait to try these. Thanks! This is an awesome idea, but it's disgusting to use old egg cartons. Eggs are very dirty. Im def going to try this. I love the idea of a carton to serve on a buffet setting and I do know that you can buy ceramic egg crates (which resembles an egg carton), people use it to hold up to a dozen eggs, this would be a great alternative to the carton one. Yes I've seen those around too, they would be perfect! Oh my gosh! What an awesome idea! I think these are sooooo cool. I am going to make these for Easter! Wow these look fantastic - I am waiting for mine to finish chilling in the fridge then I will be putting it together. Can I ask what camera you have? I love love love all your photos. How do you do it? My kids are going to love it! I hope you like the recipe! Thanks so much, I'm currently using a Canon 600D with a 50mm f/1.8 lens. By the way - these are AMAZING and I hope to impress my boyfriend's family with them! You can make them 2-3 nights before serving them, I wouldn't do it any earlier than that since it has fresh cream in it. Just keep it in an airtight container or tightly wrapped in glad wrap in the fridge! Where can I order these? And do the chocolate eggs produce the little chickens, or do they come as a free supply along with the order? Hi! I was wondering if you had any alternate ideas for the yolk? Maybe something on the not so fruity side? Sure...anything yellow coloured would work. Like making regular icing or buttercream with yellow food colouring. Or make more cheesecake filling and add yellow food colouring. But to be honest I think the recipe benefits from the fruit, it gives some contrast in flavours. At first I thought that they were really eggs! I'm totally making these for my family during Easter! ....... you are a dirty, filthy slob with a sense of humor .... lol!! ........ I really do not have the patience or the skill to make these myself, but somebody can make them for me if they would like. Cheesecake and chocolate .... my idea of Heaven! Totally awesome! And I just saw that Costco (USA) carried hollow chocolate eggs about that size yesterday and was wondering what I might do with them! Now I know! These little eggs look so real! They are cute and beautiful! Thanks for the smart idea. No matter you like real eggs or not, everyone would love to have one of these eggs! Genius. Can't wait to try it! What a brilliant idea and so easy! I have to give these a try! Hi! These look fabulous! Would you mind telling me what icing sugar is? I'd love to make these for my family. Libby - Google is your friend! Icing sugar is confectioners sugar. this is good! something different for Easter this year. 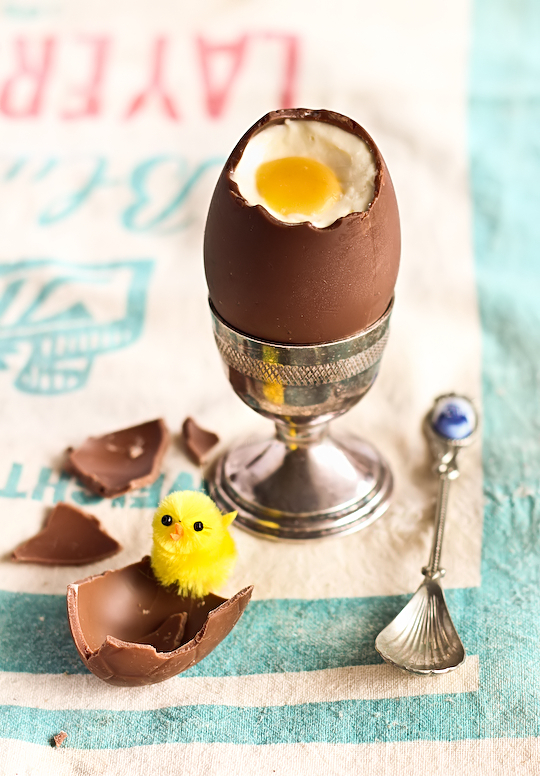 I will need to find the chocolate egg shells on time though to make it for easter. These look amazing! Love them... and the chicks are super cute too!! Looks yummy! Would lemon curd work for the yolk? Yes, I already mentioned in the recipe that any fruit curd would work as an alternative. 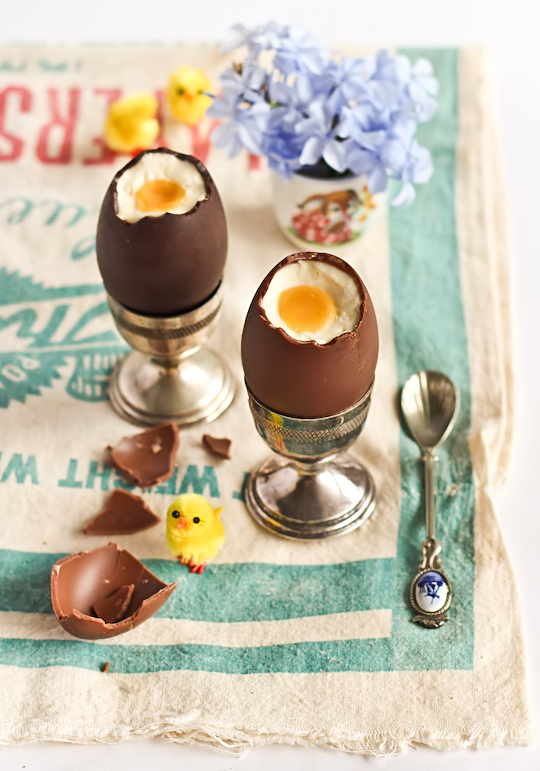 What a brilliant idea for an Easter treat!! Love! I'm confused about the yolk, is it 1 passionfruit that you use or passionfruit juice? Sorry, just not clear to me. Sorry I thought it was clear. I used the strained pulp/juice of 1 passionfruit. Great tip! Though just cos I said supermarket I didn't mean home brand, the eggs I got were pretty decent quality and real chocolate. I hate the cheap 'chocolate' eggs too! As a big (emphasis on big) fan of desserts, sweets, cheesecake and eggs, I give this a big 2 thumbs up. Now if you could come up with a recipe for diabetics that would be fantastic. We can eat the dark chocolate, the darker the better, but I'm afraid the cheesecake filling will be too much for us. 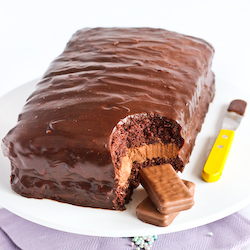 It does look fantastic though and anyone who can eat this enjoy one for me, wouldja? It will be a hu-u-u-ge sacrifice on my part but I would be glad to help you out. Do you want details later or should I keep them to myself?? Could you maybe make them smaller to get within the range of permitted sugar intake? They could be wren's eggs instead of chicken eggs. Non-diabetics could have more than one or you could do some large and some small. I'm going to try and make them with a thick yogourt instead of the cheesecake. I don't know if it will work but worth a try. Someone has probably already asked I am sure, but these egg shells are pre-made store bought? I can't seem to find anything like this around...Should I look for molds? I check Costco on line as I don'[t have one close by and they search was fruitless. Yes in the recipe I stated I bought the shells premade. Unfortunately they don't appear to be as common in the US as they are here in australia, but it seems pretty easy to make your own! See the anon comments two above yours and several below yours. Great idea! Any idea where else in the US we might be able to get the eggs? I live in Louisiana and there are no Costcos in either my state or the next nearest state (MS). Thanks! See my reply to the comment above, I will update the post if I hear from anyone that finds ten but I can't help that much since I'm in australia! firstly, thanx for an awesome blog! I really think you have amazing talent. 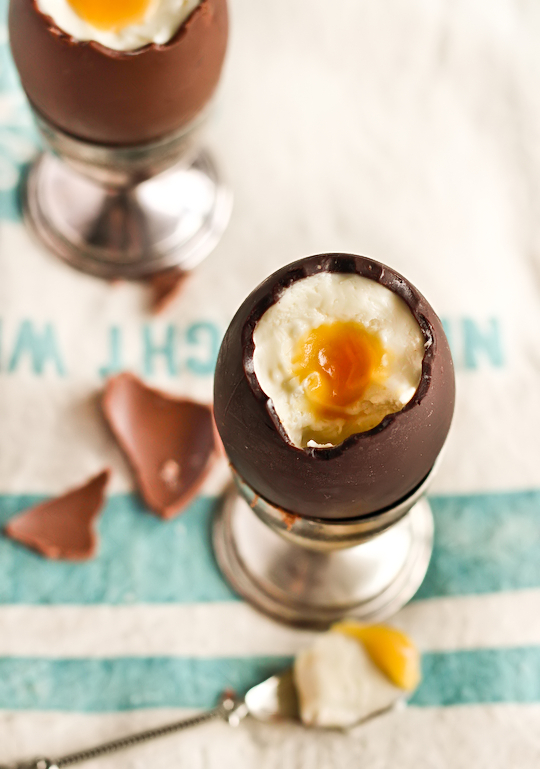 I am planning to make these over the weekend and would just like to know whether you spooned or piped the cheesecake filling into the choc eggs? :D That is an awesome idea! I love it! it is an absolutely brilliant idea :) Happy Easter! is there any way to make the chocolate eggs as opposed to buying them? You can also use a melon baller to make the holes for the "yolk". For those of us without access to the hollow eggs, I found this link as a do-it-yourself hollow egg. Anybody in America find a store beside Costco that sells these shells? I don't have a Costco membership. Thanks! See my updates in the recipe, unfortunately I can't help much since I'm in Australia but other commenters have found them online or made their own (which seems pretty easy). First, I found eggs on Amazon.com, but there weren't that many bags left (they were sold in bags of 40 for around $20.) Second, I'm wondering how much in advance can you make these if you store them in the fridge? I'd like to make some for Saturday and some for Sunday (different social events) but I'd like to make them all at the same time. Does the filling get weird if I were to make these on Friday? Maybe wait until right before I head out to put the sauce on? Please advise. Thanks! Nice! Thanks for the tip! You can make them about 2-3 days in advance, so Friday is fine. I wouldn't do it any earlier than that since it had fresh cream in. Just keep them stored held upright in either an airtight container or covered well in clingfilm so they don't dry out. Yes I suppose you could make the sauce on the day so it's not so set, but still give it at least half an hour to thicken or it will be too runny. Hope that helps! These look so cute!! I cannot wait to try them! For anyone in the US who is having trouble finding eggs, you can also find molds at most local craft stores or even try the discount stores (Big Lots and Ollies are two one the Eastern side that I frequent) they seem to always have a wide range of different candies that you cannot find other places. You mentioned making your own eggs, because if Costco is the only place to get them, I'm not buying a membership just to go once. I don't even think there is one in my area. How do you make the egg shapes? Read the comment above yours, and the updates I made in the recipe - you can either use moulds or a cleaned out chicken egg shell. Where did you find the different hollow eggs? please read the recipe and the comments in the post. wow and wow again!! these eggs are truly awsome. i hope they were just as good as they look. Lo tengo que probar! Gracias! awesome recipe and beautiful pics! I repinned this post yesterday, today going to try out the recipe! will let you know if my Italians liked it :) Happy Easter! I put this on my blog! Can't wait to try it out. 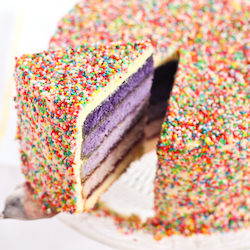 This is the perfect addition to my Easter brunch on Sunday! I am going to have to make these tomorrow! Thank you so much! I am in the US and had the HARDEST time finding hollow eggs but SEE'S CANDIES have them!! They do have little chocolate chicks in them but once you cut the top open they will fall out, and the chocolate is delicious! My Costco didn't have the eggs. I tried to make some using plastic eggs as molds, but the chocolate stuck. I'll have to plan ahead and order some next year. I just made one to try and it was super easy and yummy! I used the Philadelphia cheesecake filling and lemon curd. I'll be making more tomorrow to take for family Easter. I plan to use the bottom half of a clear pop pan to carry them. Thanks!! you could use a jello no bake cheesecake box and a can of lemon meringue pie filling if youre feeling lazy. you could even fill half with the cheesecake, add a dollup of lemon, add more cheesecake and it will be a little surprise! Everything on your blog looks so delicious! I'm following! I went to Costco yesterday hoping to track the eggs down but unfortunately couldn't find them. These are precious; thank you for sharing! I am so excited to make these today! I decided instead of trying my luck finding the eggs at costco I am going to take those plastic eggs as a mold and continuely dip the egg in melted milk chocolate until I get the thickness I want. Hopefully they turn out or it will be just cheesecake for us! lol This is such a cute idea! Thank you for sharing! I just finished making these! I get to costco to buy the eggs in time and using the plastic eggs didn't work (I think you need a proper chocolate egg mold for that) So I was adventerous and made my own hollow chocolate eggs from here http://www.notmartha.org/archives/2010/03/30/chocolate-easter-surprise-eggs/ I left the shell on so people have to crack and really eat them like softboiled eggs. 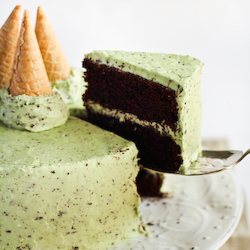 I've said it before and I'll say it again: you're a dessert/baking genius! 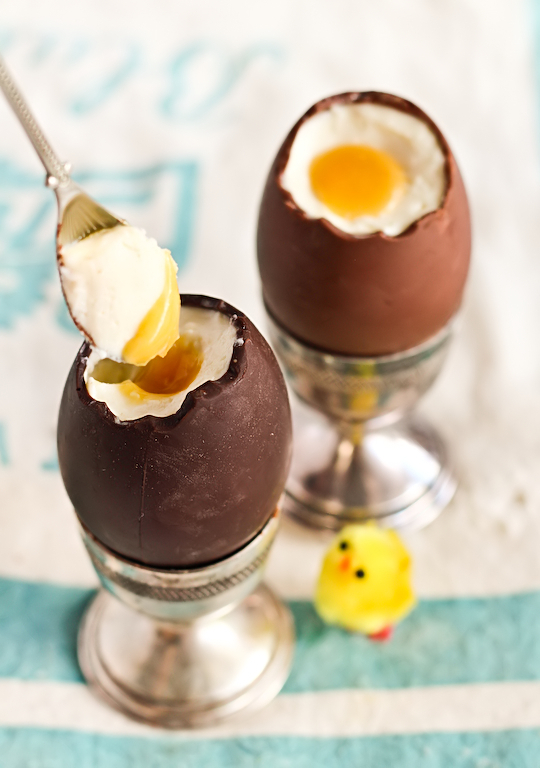 I am in Australia and bought the Chocolatier brand of eggs and made these for Easter Sunday dessert and WHAT A HIT! I got the exact eggs you pictured - the pink speckled and cookies and cream one which is a white speckled one and 4 other flavours in the Chocolatier brand available from Coles or Kmart for $10 for six eggs. It is such an easy recipe. It was A DELIGHT. Thank you so much for sharing this. Would love to show you a photo of mine, but dont know how to send it to you? I have just sent you a photo by email. (Fiona) Ruby. Amazing recipe. I used it today for Easter Sunday, with the good old Cadbury eggs come in the their own egg carton which mae it nice and easy! I cheated a little and used some delicious Yackandandah Jam's Lemon Curd. Everyone raved about them, will definitely be making again! these look delicious...but is anybody else disturbed by the little chicks watching you eat their unfertilized siblings with a spoon? I made them!!! they look no where near as photogenic as yours, but they taste soo goood! Thanks for the great recipe! I made them yesterday with a caramel filling instead of passionfruit and posted about it here. Worked perfectly! Wish I read this recipe earlier! Could of made a batch for Easter! How cute are these??!! 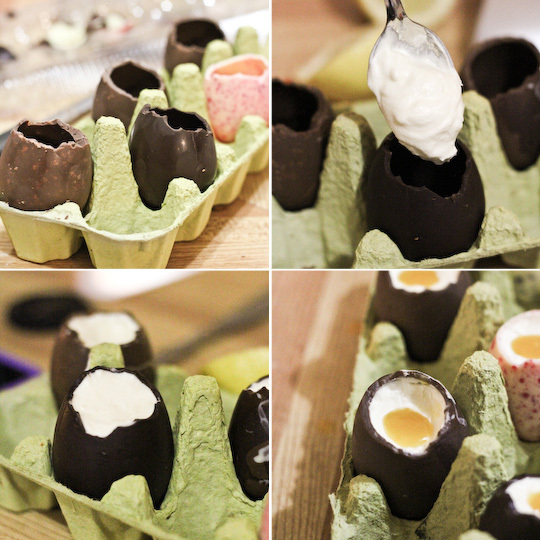 I have never been a fan of traditional cream eggs (I know, gasp) but cheesecake filling - yes please! We made these today. My hollow eggs were smaller as that is all I could find, but it made them perfect canapé sized so would well for a party. Being a lazy person, I couldn't be bothered digging my beater out to do the cream separately so I just bunged everything in my Kenwood and turned it on worked well. And passion fruit are as hard to find as hens teeth here so I used lemon curd and coloured it with a tiny bit of food colouring the flavours worked well together. Thank you for the great post I am glad I came across it. Wish I had found your blog before easter...these look insanely good!!! I made these on Sunday morning after seeing them on here last week. They were so easy to make, yet they looked awesome and tasted so good! Thanks for the inspiration. I made these for everyone at easter. They were fantastic! Thank you for this different and amazing idea. I also brought the passionfruit pulp in a tin and froze the leftover passionfruit for future use. Why couldn't you spray "Pam" inside plastic eggs, melt chocolate and swirl around inside each half to thickly coat, chill, then, carefully remove and fill with cheesecake, poke your finger in center, fill with "yolk", press halves together, and chill again? Yes I believe others have already thought of this, with mixed results. Give it a go if you wish! What a great idea! Think I might try filling them with vanilla ice cream with a passion fruit yolk. Then freezing them until needed. Beth. One. Huge. WOW! That is the Easter threat! I am gonna serve these jawdropping brilliants this Easter. Thanks for recipe! Greetings from Warsaw. wow. I see a UK blog has ripped you off this morning. She's linked to your Twitter page NOT this post and saying she 'got the idea' from you, means she is basically implying that she made up her own recipe. Am shocked. Maybe its since been edited but I came to your page from the blog Sara is referring to and there is a link to both this page and your twitter page. I guess there's no such thing as trying to do someone a good turn when you like what they do anymore. the author has expressly stated she got the idea from you. damn keyboard warriors and cyberbullies. glad she updated, but she has a history of nicking other people's recipes & not crediting. Her slutty brownies for one. You may want to go and check out the UK blog called 'The Londoner'. She has taken this recipe from you and hasn't credited you in the correct way. She has linked to your twitter account, which in the laws of blogging (which she has been telling others all about this weekend) she should link to the page that she has ripped your content from. She is taking the credit for this invention and it is not fair! This weekend she pulled up a blogger who made something (that had the same name as) she 'claims' to of come up with and shamed them on Twitter. It is not far that she is doing one rule for one and another rule for others. I had to do some digging to find your blog and this page and others won't take the time to do the same. Such a darling idea!!! Hope to give these a try next Easter! I have also found you through a UK blogger and already love your blog. Your recipes look amazing, can't wait to try some out. They look fabulous, just like real eggs. I have shared a few pics on my blog linking back here for the recipe. Happy Easter. I've decided to try this with a deeper centre and replace the passionfruit with dulce de leche topped off with a wee bit of condensed milk (died yellow for effect). The condensed milk will look runny and gooey. The taste of the dulce de leche with condensed milk will be delicious. I'll let you know how it goes. I think it's a good replacement for people with an even sweeter tooth... or who aren't fans of passionfruit or jam. Oh and p.s. I just came back from Coles with ingredients and they have a pack of 12 hollow eggs in a plastic egg container for.. *wait for it* ... $4!!! I know these will be the cheap non-yummy ones... but because I have to make in bulk for church - I can't afford to buy the $10 chocolatier ones that only come in a pack of 6. Plus now I have salmonella-free egg crates! hooray. ...gotta say though - those chocolatier ones looked oh-so-beautiful. I attempted these this weekend and they turned out great. A few notes for those in the US where the eggs and passionfruit are not easy to find. I got mine online via See's as suggessted. They are great quality chocolate, but VERY expensive. They also have a "cracked" looked to them which makes them VERY difficult to get the tops off. I ended up using a hot knife and it took over an hour to do a dozen. This part was very time intensive. The cheesecake part was simple, easy, quick and tasty. For the yolk, I did apricot Jam and orange juice with a touch of butter. I added 10x sugar to make it sweet enough. All ingredients for the filling are easy to find as well. While the filling is easy, I think making the chocolate shells may have been easier than trying to cut ones that are already made. Overall, the end result was adorable and I would make these again. Thanks for sharing this recipe! I made these myself for Easter this year. Only thing I did differently was I used caramel sauce instead of fruit sauce for the yolks. It's very wonderful and very good. I love this recipe !!!! The best food blog i have ever met! AMAZING! This is the BEST idea ever. I absolutely love creme eggs. It would be so impressive to serve up something home made that looks so good.